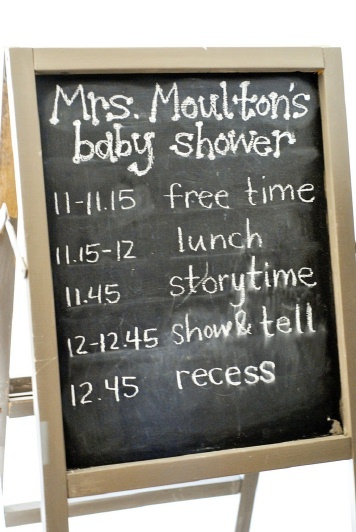 When Whitney's friend, an elementary school teacher, got pregnant, the theme for the baby shower was as easy to decide as A-B-C.
A back to school baby shower! 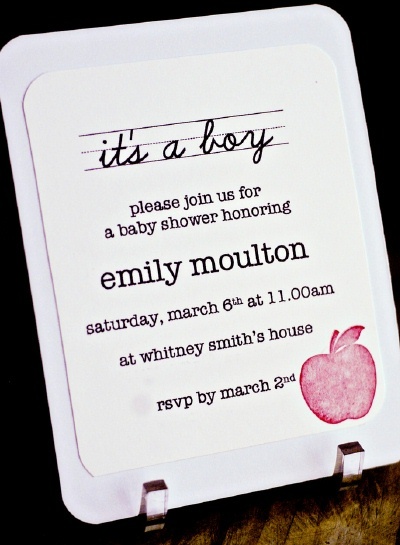 Whitney started by making cute invitations for the party. She picked up a chalkboard easel off craigslist and set it up as a cute greeting for her guests. 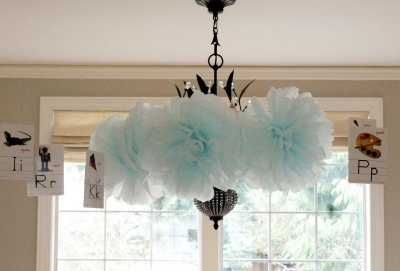 She hung blue tissue pom poms as a pretty and soft touch to the party. Aren't they beautiful?! They displayed pictures of the mom and dad as kids. 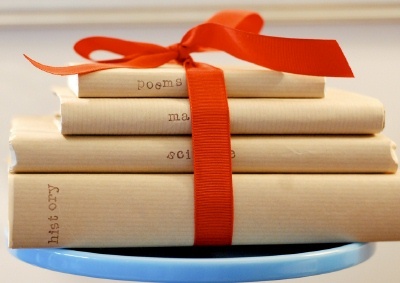 They also covered books as a nice school decorative touch. 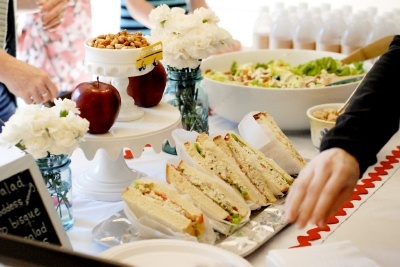 As the guests arrived, they let them chat and enjoy themselves as final preparations were made for the lunch. Just check out this food table! Isn't it so cute! 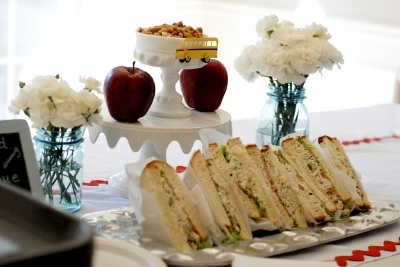 and decorated with lots of white, apples, and school themed touches. 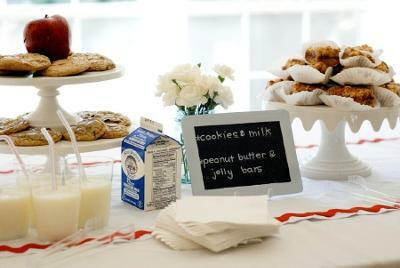 The menu was displayed on mini chalkboards to give an authentic school feeling. 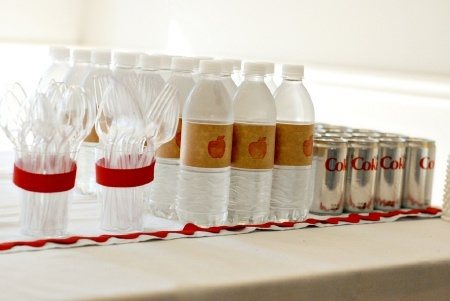 They wrapped water bottles with paper and stamped them with apples as a cute decoration. They also provided the "other water" for their guests to enjoy. 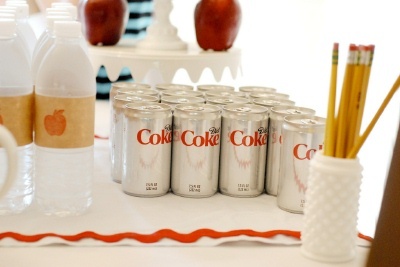 :) She picked up these cute skinny diet coke cans at Target. The meal was served on...cafeteria trays! I just had to include this picture of the mom-to-be. So cute! As the women enjoyed their lunch, they had story time. 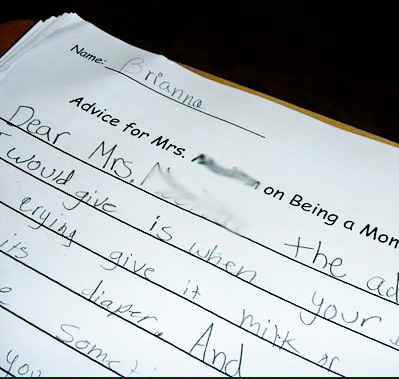 They had planned a secret surprise for the mom-to-be by having her students write her advice. Everyone got quite a kick out of their suggestions! After show and tell..."opening presents", the guests enjoyed after school snack time. 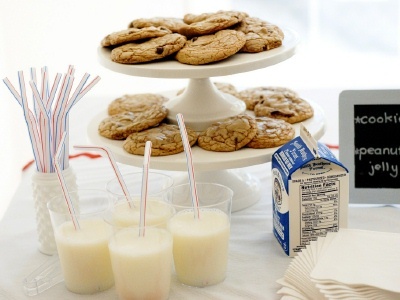 They had peanut butter and jelly bars, milk and of course...cookies! (Poor Whitney was in the kitchen sweating it out during the opening of the presents to make sure the cookies were hot out of the oven!) Now that is dedication! 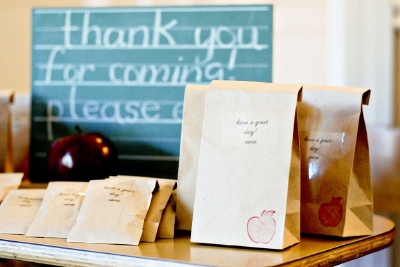 For the baby shower favors, they filled lunch sacks with hot tamales and a special thank you note from "mom". As a special shower gift for the mom, Whitney personalized a comp. book with all of the shower memorabilia. So cute! 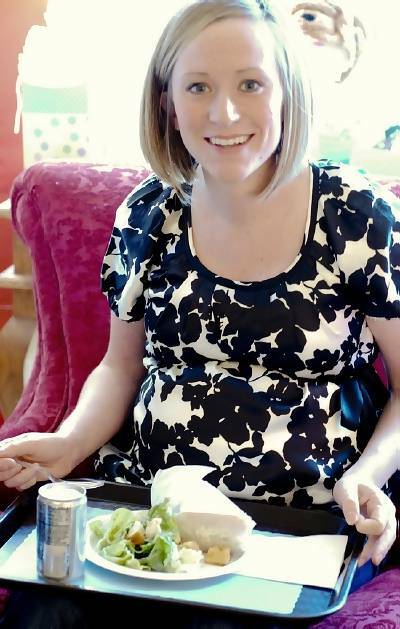 Thank you so much for sharing your school baby shower story with us Whitney! I am going to use this theme for a Labor Day shower for my friend. Thank you so much for the ideas! They have helped so much. 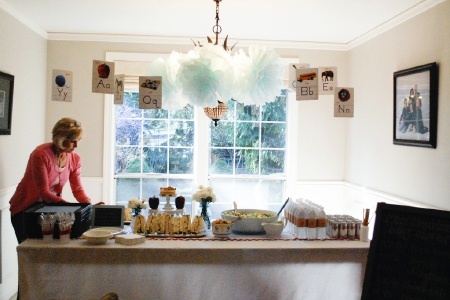 My sister in law is a teacher, so a school themed baby shower is perfect for her. 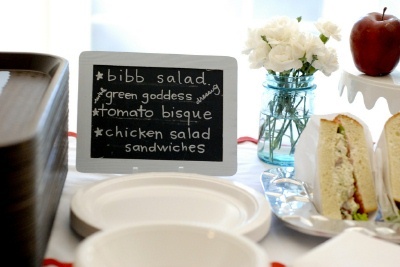 Love the chalk board idea and the lunch trays! I am going to use ABC blocks and flash cards in my decorations. I am also going to display the mom and dad's school pictures in a fun hanging collage. Thanks for the inspiration! Wow. Awesome thanks so much for the ideas! !